In the midst of a Royal Commission into the nuclear industry in South Australia, the Australian Nuclear Free Alliance (ANFA) held it’s 18th annual gathering of Aboriginal, environmental and public health representatives on Nukunu country in Quorn, SA. In February 2015 the Royal Commission into the Nuclear Fuel Cycle was launched in SA, exploring the development of further uranium mining, uranium enrichment, nuclear waste dumping and nuclear power generation. While a Royal Commission is a big process, many people do not know it is happening. Communities have not been engaged or invited to be part of the process. Issues papers were not translated into language and community voices are not getting a place at the hearings. Many people have lodged submissions in language and spoken out through the media. Concerned groups have been having meetings in the city and the bush to organise around the Commission. There is a strong sense that the real agenda is to build an international nuclear waste dump. The message from the communities is strong and clear – to a waste dump the people are saying no. ANFA has endorsed the Port Augusta Declaration saying no to the nuclear fuel cycle in direct response to the Royal Commission. The ANFA meeting acknowledged and celebrated two decades of successful community campaigning against federal government moves to impose radioactive waste dumps in South Australia (Irati Wanti) and at Muckaty and other sites in the NT as significant human and environmental rights victories. The Federal Government is due to release a shortlist of sites to be assessed under the revised process. Sites that have been revealed to date have all been strongly contested by Traditional Owners and local community members. ANFA will contact people in nominated areas to offer support and help campaign against a national radioactive waste dump being imposed. As ANFA met, the first shipment of reprocessed radioactive waste had just left France heading to Port Kembla in NSW for extended interim storage at the Lucas Heights nuclear reactor complex. ANFA will monitor this development and views Lucas Height storage as the least worst management option for intermediate level waste. ANFA has been pursuing connections with the international nuclear free movement. ANFA Co-chairs and committee members presented at the World Uranium Symposium in Quebec, April 2015. They met people from around the world from impacted sites. Connections have also been made with First Nations people, activists and environmental organisations in Taiwan, Saskatchewan (Canada) and in Africa. This helps us share information, experiences and campaign ideas across oceans and borders to restrain and close a global industry. We’ve got our eyes on the Beverley 4 Mile and Olympic Dam uranium mines in South Australia with plans brewing for further protests in 2016, including ‘Lizard Bites Back’ at Olympic Dam in July 2016. We are tracking BHP Billiton’s plan to use acid heap leaching to extract uranium. We acknowledge and remember the successful lobbying efforts by the Camp Law Mob and Arkaroola leaseholders to have Arkaroola protected from uranium mining as a great win. We are celebrating movement towards the end of uranium mining in Kakadu National Park. Energy Resources of Australia has cancelled the planned Ranger 3 Deeps underground mine, and the Mirarr people want to see the site fully rehabilitated and closed by 2021. ANFA is monitoring the rare earths project at Nolan’s Bore near Ti Tree in central Australia and sends support to the Traditional Owners of Borroloola who are calling for Glencore’s dirty zinc mine to shut down. After a strong community campaign, the Queensland Government elected in January has reinstated a ban on uranium mining and is also opposed to any federal nuclear waste dump in the state. Despite the Government overturning the ban on uranium exploration in NSW in 2012, only one company applied for an exploration application. The continuing community campaign and NSW Uranium Free Charter will help us keep the uranium industry out of NSW. Since the state ban on uranium mining was overturned in Western Australia in 2008 not a single uranium mine has begun production. ANFA is speaking out against uranium mining at Kintyre, Yeelirrie, Wiluna and Mulga Rocks and will continue building community led campaigns to keep companies like Cameco from getting a foothold in both the Goldfields and the Pilbara. The threat remains but together we will fight it. While acknowledging medical application of nuclear materials, ANFA heard from doctors that there is no safe dose of radiation and there is growing evidence of the health impacts of radiation exposure. 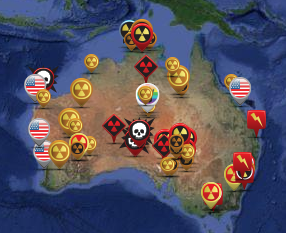 Aboriginal communities have known about radiation and risks for a very long time. ANFA supports calls for an inquiry into the health impacts of the nuclear industry in Australia. Delegates at the meeting are committed to building ANFA’s networks and capacity to support community action on nuclear issues and reaffirmed their commitment to actively advance a nuclear free Australia. Antikarinya, Arabunna, Arrernte, Kokatha, Luritja, Martu, Ngaanyatjarra, Nyoongar, Warlpiri, Warramungu, Wongutha, Yamtiji, Yankunytjatjara, Anti Nuclear Alliance WA, Australian Conservation Foundation, Beyond Nuclear Initiative BUMP Collective, Conservation Council WA, Footprints for Peace, Friends of the Earth, Josephite SA Reconciliation Circle, Ngoppon Together Inc., Murray Bridge Reconciliation Group, Nuclear Operations Watch Port Adelaide, Peace Collective FoE, Qld Public Health Association of Australia, Uranium Free NSW, Walkatjurra Walkabout. Site by Back to Front Design.